Track Runner – for runners that don’t compromise. Track your run, analyze your performance & train smarter with intervals. Award-winning Track Runner is packed with run-centric features and completely free with no in-app purchases or ads. After all, running is free - why pay for your training?! Features + Heart Rate: Train in the right zone with Bluetooth LE heart rate monitor support. + Intervals: Select from adaptive interval workouts or create your own. + Pacer: Helps you pace yourself to reach your goal. + Cadence: Analyze your stride rate and minimize injury risk. + Genius: Estimates your race times. + Gear: Track your shoes’ stride rate and all your gear’s mileage. + Live tile: Motivates you to go running. Statistics + Splits tables, fastest distances & laps, pace and heart rate graph, elevation graph and cumulative elevation gain, weather. + Cardio Map + Interval training analysis. + Weekly distances chart, records, lap records, total steps, average stride rate. The complete list of features: + super accurate GPS tracking + intelligent track and lap recognition + supports most Bluetooth LE/Smart/4.0 heart rate monitors + customizable heart rate zones for more effective training + Cardio Map (analyze in which heart rate zones you trained and share your Cardio Map on social networks) + adaptive interval training with intuitive option to build a custom workout + Pacer feature including negative splits option to pace yourself during a race or to beat your personal best + powerful statistics (fastest times accurate splits, calories burned, elevation data, pace & hr graph, average stride rate etc.) + gear mileage tracker including shoe-cadence analysis + Auto-pause and auto-resume + live tracking and live cheering + Performance Genius (uses the McMillan method to estimate your potential times for popular race distances) + diary with notes feature + records of your fastest runs and laps + weather data + GPX import and export + no sign-up or membership required + automated backup + social network sharing including Cardio Map picture + voice notifications, including split notifications + works under the lock-screen + “log run” option to log indoor training + live tile + intuitive and easy to use interface Please note: Heart rate monitor support is only available for phones running commercial WP 8.1 (not dev preview). 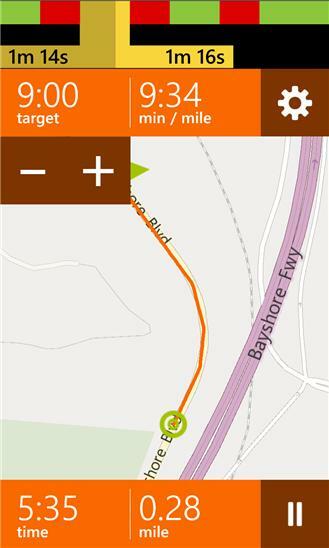 Stride rate/cadence, auto-pause, and step counting features are only available for SensorCore enabled phones. 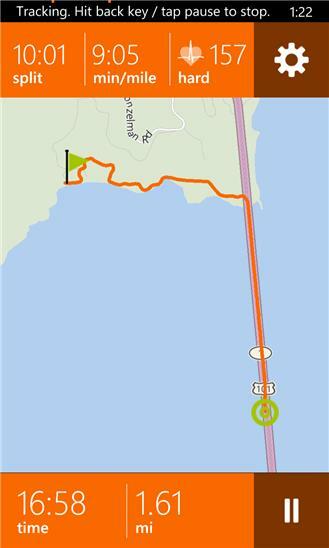 + You can now share both your run data and route to Twitter and Facebook. Make sure you update to the latest Twitter and FaceBook apps to take advantage of this! + Fixed crash on Lumia 535 + Bugfixes in the Interval Trainer and Diary. + Optionally donate to support the development of Track Runner. + Option to follow us on Twitter and Facebook.